Every parent's worst nightmare is something bad happening to their child. For Sybrina Fulton and Tracy Martin, that nightmare became a reality when their 17-year-old son, Trayvon Martin, was shot and killed by George Zimmerman on the evening of February 26, 2012, following an altercation within a gated community in Sanford, Florida. Trying to understand what Trayvon's parents went through in the aftermath of such tragedy is utterly heartbreaking and infuriating: the process of grieving in the national spotlight, dealing with uncooperative police and inept investigation officials, the tireless efforts to have their son's killer prosecuted, and how they coped when justice was denied. Trayvon's death would polarize the country on gun rights and laws, jump start the Black Lives Matter movement, and become a powerful symbol of social justice activism. Rest in Power: The Enduring Life of Trayvon Martin gives a voice, story, and meaning to a life needlessly taken away before being fully realized. 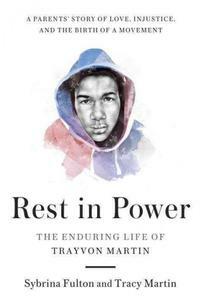 The book also charts the pursuit of redemption and justice, with Trayvon's parents establishing The Trayvon Martin Foundation, a social justice organization committed to ending senseless gun violence and strengthening families through holistic support. For supplemental resources and information from the Free Library, please view our Black Lives Matter Explore Topic with pertinent book lists and websites, our six-part blog series exploring the roots of rage concerning the events in the deaths of Michael Brown in Ferguson, MO and Eric Garner in New York, both in 2014, and social justice workshops on racism, inequality, and injustice. Tackling these tough topics through conversation and understanding is the only way we can rise above the hatred and ignorance in our society. We hope you will join us for this inspirational and poignant Author Event. Sybrina Fulton and Tracy Martin will be joined by Errin Haines Whack, an award-winning reporter for The Associated Press covering race and politics. Thursday, February 2, 2017, at 7:30 PM, Parkway Central Library, FREE. Thank you for the excellent context you placed around this event, and for holding it here. Will this event be streamed on FLP's website like Bernie Sanders's visit? Unfortunately, we will not be able to stream the event. LOVE U TRAYVON MARTIN. I'M A SONGWRITER. U R IN ONE OF MY SONGS. Every now and then I'm reminded that my 8 year old African American son is Trayvon Martin. It's a remembrance that I wish was not real. Trayvon your story will always be told and I pray someday that we (all people) will have a sequel to your story with everyone loving one another and stop with the foolish hate and profiling. I am a Sister to 3 African American Brothers, Aunt to 2 African American brothers. They are Trayvon Martin. Rest well in paradise my brother. To his parents and sibling, Hold on to God's unchanging hand. your in my prayers. Love always, The Jackson Family. Stay strong Family GOD, Bless Yall.